Siwertell, part of Cargotec, has delivered two more of its market- leading 10 000 S road- mobile unloaders for cement unloading operations in Libya and Vietnam. The new trailer-based, diesel- powered machines are fitted with a double bellows system and dust filters and can handle cement at a rated capacity of 300tph (tonnes per hour). Following an order signed with Tenovar International Ltd in Malta in late June 2015, the first unloader was delivered promptly in August the same year. In February 2016 it will be commissioned in Tobruk, Libya and will operate for Mediterranean Cement, also known as Al Bahar Al Mutawaset Cement. The second unloader was ordered in November 2015 by Koastal Industries Pte Ltd, on behalf of leading Vietnamese cement exporter, the Vissai Cement Group and was also delivered only a month later in December 2015. It will be used for cement unloading at two sites in Vietnam and was ordered as part of the group’s ongoing expansion plans. The contract includes spare parts appropriate for two years of operation. Commissioning is scheduled for spring 2016. “In the cement bulk-handling business Siwertell stands for reliability and therefore we believe that by choosing our units, the customer chooses the best tool in the business,” says Jo¨rgen Ojeda, Director, Siwertell Mobile Unloaders. “The ease of setting up, operating and folding away our road mobile unloaders makes them extremely flexible and cost effective for multi-terminal operations. 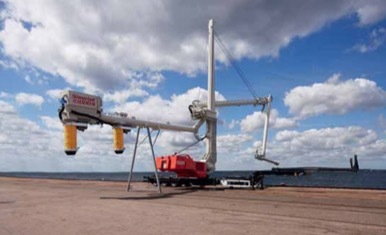 For example, the Vissai Group’s operation will use its mobile unloader at a number of ports in central Vietnam, separated by distances of up to around 300km,” continues Ojeda. “Both customers were influenced by the reliability offered by Swedish-built technology and by Siwertell’s ability to offer scrupulously clean unloading operations and excellent references from the cement industry,” he adds. Siwertell mobile systems were originally developed for unloading cement. Years of experience and development reflect the company’s deep understanding of cement handling and gives it the ability to provide valuable advice to its customers. The Siwertell road-mobile unloader is one of the most reliable, eco-friendly and sustainable systems on the market today for cement operations. Its flexibility and capacity combined with low operational and maintenance costs are major selling points. As there is no need for any civil engineering works, our mobile unloaders can start operations almost immediately after arrival on site.